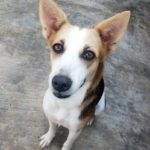 Princessa – has a pending adoption! Princessa was rescued by one of our amazing volunteers, Yumiho. She is a complete doll, so beautiful, and so, so sweet. She loves every single person, gets along with dogs and is incredibly soft. Princessa has the most soulful eyes we have ever seen.